NYT issues correction to front page climate story – Monckton: "offends grievously against all of these [journalistic] principles." | Watts Up With That? NYT issues correction to front page climate story – Monckton: "offends grievously against all of these [journalistic] principles." NYT and Reporter Revkin Issue ‘Correction’ – Admit ‘Error’ in Front Page Global Warming Article Touted By Gore. But just little more than a week after publishing the front page article, The New York Times and reporter Andrew Revkin have now admitted the article “erred” on key points. Revkin wrote about the now defunct Global Climate Coalition and documents that suggest the group had scientists on board in the 1990’s who claimed “the science backing the role of greenhouse gases in global warming could not be refuted.” Revkin’s article came under immediate fire from scientists and others who called into question the central claims and the accuracy of the story. The New York Times also posted an “Editors’ Note” on May 2 with the same correction. May 2, 2009 in Climate_change, media. This article (the original, retracted one) is posted over at Real Climate, 2 or 3 entries down. Do you think they will just make it disappear, or will they put the retraction “into context” for us? The NY Times achieved their nefarious aims. How many read and will remember the original front page article versus how few read the editor’s retraction. It is however an excellent and explicit example of how AGW proponents (including scientists) are willing to lie to promulgate their religious agenda. Al Gore better issue an apology to Congress, to the industries he called Madoff like schemes based on lies to get people to invest in them and to the millions of people who watched his testimony and believed every word of it. This kind of obvious story planting based on false and unverified information that forced a central point retraction, perpetrated by the the NYT to reinforce Gore’s testimony is an example of how the Democrats are poisoning the well of public opinion and feeding the fires of populist rage against Corporate America and Wall Street. Media bias is one thing, but keep in mind that the NYT is in financial difficulties and is soliciting “donations” rather than investments and it is hard to not wonder about the motivations here. The discovery of a later version does not do much to change the original story. The Climate Coalition still cut things that it disagreed with out of later version of the scientific advisory group’s paper..
Revkin points out in his blog where he explains the difference between the old and newer version. Original article in the Thu edition. Retraction in the Sat edition. On the bright side there is all the wonderful advances in medicine.I thank science for that. I spent a lot of time last year trying to convince Andy Revkin and dotearth readers that there was a big problem with the CO2=AGW paradigm, without much success. Andy is a committed alarmist and has been for two decades. However, I have a lot of respect for his intelligence, curiosity, and integrity. I predict he’ll get it right eventually, and get a Pulitzer, too. It is amazing how many respected news sources are allowing their credibility to deteriorate based on one false story line. When the Global Warming Narrative being propagated by the mainstream media comes unhinged, and it will, the backlash against some of the most respected media outlets (especially the NY Times, BBC and the Economist) is going to be severe. People don’t like to be lied to and that’s exactly what’s happening right now. To the editors of the NY Times, BBC and the Economist, why have you allowed your institution’s reputations to be hijacked and maligned by a bunch of sloppy charlatans? 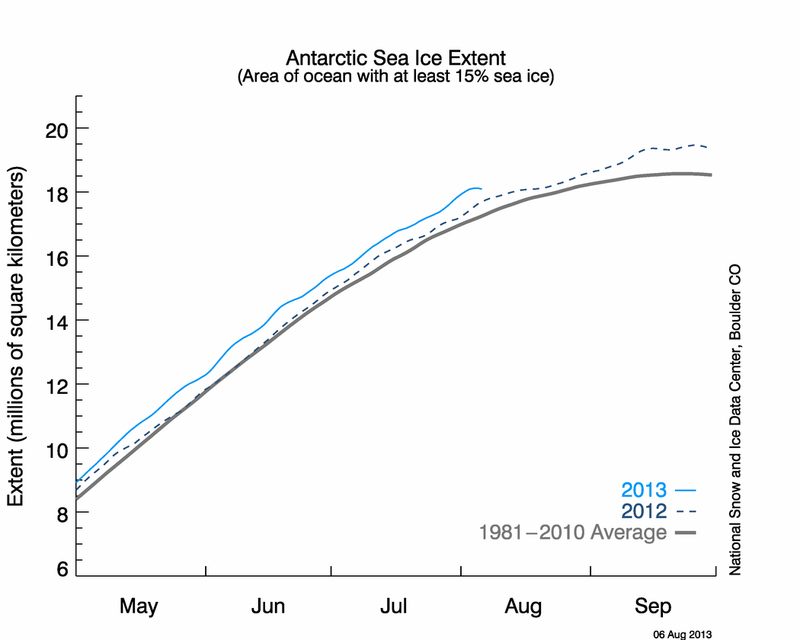 Antarctic sea ice extent is well above average and the Arctic sea ice extent is quite close to average. 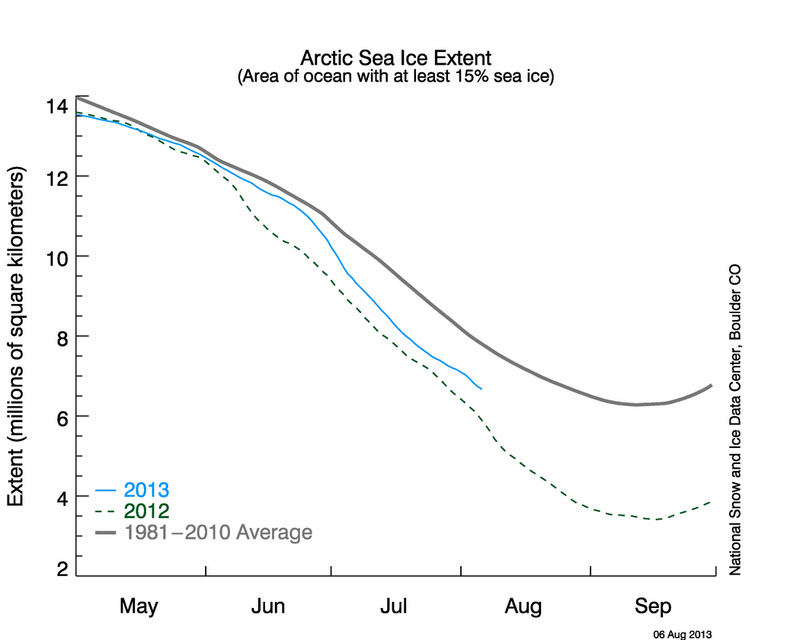 The fact is that sea ice is not disappearing at alarming rates as has been reported. As noted at Climate Audit in ‘Unthreaded’ reader MJW also noted the problem and alerted Andy, who promised to review it. MJW also deserves credit for straightening out this mess. The New York Times, and a lot of other MSM newspapers, are liberals and many of them are going bankrupt. Why? Because they’ve lost their objectivity and have become politically left leaning. The public is wise to that and the Internet has been the major cause of their demise since it has been the counter balance to the MSM. It won’t be long before the NYT and others like them become irrelevant. Totally off topic, but MJW, and I think it is the same person, was the first to figure out that Richard Armitage was the original leaker in the Valerie Plame case, by analysis of redacted portions of testimony. Here I tiptoe into politics, and may get snipped, but the Sainted Prosecutor, Patrick Fitzgerald, completely excused Sir Richard, in order to pursue a member of the White House, Scooter Libby, who hadn’t even leaked Plame’s name. The relevance, which may save this comment after all, is the destructive capability of a false meme in the mainstream media. As this argument of Anthropogenic Global Warming and/or its newer version called Climate Change, notoriously has been disapproved by the scientific community, it would be advisable for those who used it as a means to get an specific goal, to chose another and quite different argument more adequate for their purposes. And the money, the power, the influence, the control … follows the the power and the control over cultures and nations that the “religion” of AGW provides. So the enviro’s have won 3/4 of the battle by the way they have defined the terms and the judges of the debate. And the socialist news media IS the source and the method of the control of our cultures BY the socialists internationally. Follow the money – to find the REASON why the money and the control is flowing. I challenge you to justify the timing of the article’s publication — and then give us your word that the date of publication was mutually exclusive of the date of the Congressional hearing w/ Al Gore’s appearance and that there was no collusion regarding the article’s publication date. Will you allow this comment to be published? Because preaching to the faithful is the only lifeline they have left. They’re becoming extinct. As long as Gore is going to stand up on Hansen’s AGW soapbox and yell fire on a crowded planet, reports are going to get stampeded, and a lot of public opinion is going to be alienated to him. The man is going about with a chip on his shoulder, picking fights. The world will learn to hate you, Mr. Gore. This article makes no sense. It’s just a collection of unconnected convoluted statements, which I can’t be bothered to try and string together. Very interesting how the correction still refers to the ‘scientific evidence’ (last paragraph) as if it is fact. What they should have said is ‘a large set of published results from studies and simulations’ which is what it is. I also would like to state for the record, as I am a scientist, that something being peer-reviewed does not mean that it is correct; it just means that it has been deemed sufficient to enter the scientific debate. I keep hearing this ‘meme’ in warmist arguments e.g. ‘do you refute the large amount of peer-reviewed articles’ as if the minute they were published they became correct. And that there is a ‘right’ and ‘wrong’ side in scientific debate. As an example, I did my PhD in ferroelectric materials. A lot of people are trying to make capacitors out of these materials so that they can make smaller transistors and memory elements. The big issue is called the size effect. If you take a material like Barium Titanate (BTO) and have a crystal or compressed powder the dielectric constant is about 10000 (This may be wrong but it will do for comparison). If you make a thin film (3 microns thick and below) the constant starts to drop as the film gets thinner. Its can get as low as 100. Many people came up with theories that it was to do with couping effects and the number of unit cells in the material, or others had parasitic capacitances near the electrodes called ‘dead’ layers where there was no polarisation etc. There are reams of papers on this and for want of a better word it became the ‘consensus’. Then some friends of mine managed to get a crystal of BTO and cut a 75 nm slice of it and make a little capacitor. They did some standard material processing on it (annealed it) and low and behold it had the same dielectric constant as the bulk crystal. Turns out the ‘size effect’ was purely about how good the interfaces were and not to do with the actual crystal properties. So it goes to show that peer-review simply puts these papers out there for debate. The theories were wrong. A beautiful and elegant theory can sometimes end up soiled by the ugly truth of a methodical and well characterised experiment. I come across a peer reviewed statement on a blog in a newspaper.I said as far as I was concerned the man made global warming theory was getting peer reviewed on the net. “Original article in the Thu edition. Heh, yeah, Saturday being the paper with the least circulation. Also, original posted on page A1 probably, retraction probably on page Z-93 in tiny type between a couple of foot powder ads. Andy is a committed alarmist and has been for two decades. However, I have a lot of respect for his intelligence, curiosity, and integrity. I’m very sorry Kim but I can’t let this one pass. If he’s a “committed alarmist” how on earth can he also be described as having “intelligence, curiosity, and integrity”? Being “committed” is, as far as I can see, being firmly wedded to a particular point of view and therefore can’t possibly be included in the second sentence of the extract above. The New York Times financial difficulties and impending bankruptcy can be summarized in one word. That last point could apply to almost any major news outlet in the United States. They could all learn something and take into account the historical context of media coverage of climate change. Don’t Stifle Debate: Most scientists do agree that the earth has warmed a little more than a degree in the last 100 years. That doesn’t mean that scientists concur mankind is to blame. Even if that were the case, the impact of warming is unclear. People in northern climes might enjoy improved weather and longer growing seasons. eric (09:30:14) : The discovery of a later version does not do much to change the original story. The Climate Coalition still cut things that it disagreed with out of later version of the scientific advisory group’s paper.. So what? There is no convincing evidence that the models are valid particularly in light of their abysmal lack of predictive power. It’s up to the modelers to prove the worth of the model(s) and not at all the task of ‘contrarians’ to disprove. For example, take the following hypothesis Extraterrestrials have visited Mars and the Moon . Would it be your job prove it wrong or mine to prove it right? If the latter, what purpose would a statement of inability to disprove serve except to unjustly lend credence to the reversal of roles? Or are you of the opinion that AGW models are special so don’t require proof of worth? A fair question. I think the answer is that for someone of his intelligence and curiosity and integrity, and with committed beliefs, it is difficult to change one’s mind. He saw his beliefs validated for two decades, and only within the last year has he been exposed to significant skeptical opinion. I interacted with him and dotearth readers for months, and he would listen respectfully, consult his panel of experts(predominantly alarmists), and come back with the predictable true believer responses. However, he did allow my heretical comments, and that of others, and he would seriously consider objections. And he is slowly exploring the world of the skeptic; he just hasn’t gotten there himself, yet. As I say, I think he’ll get there eventually, as the globe is unequivocally cooling, and the CO2 effect on climate has been unambiguously exaggerated, and when he does, it will be a gamechanger. Keep the faith; I am. I have high hopes for him. Also, parsed as it is, admitting some error in this story is another sign of integrity. I also doubt that Revkin colluded with Gore. I had hints last year that he, too, is suspicious of Gore’s motives and aware of his flagrant hyperbole. If the NYT would adopt these rules (again) it would result in a better newspaper. Many people have stopped reading the NYT and it’s not because of the current crises. And I’m also pretty that Andy Revkin has a lot of respect for the Pielkes, Pere et Fils, and for Steve McIntyre. Your point about not stifling debate is another plus for Andy Revkin and the NYT. The skeptic has a very fair opportunity to be heard on Dot Earth. The skeptic also has a very good chance of being trashed unfairly and unmercifully by the true believers there, but the moderation was honest. I only had a few comments not posted in eight months of commenting, and in retrospect, they got over the line of civility. There is a fine debate going on at Dot Earth. That it is 10:1 Alarmist vs Skeptic is also true, but the skeptics are getting their licks in. I’d still be there, but it got to the point that I’d already said what I had to say about a hundred times already, and the board started requiring registration. I’ll stick at that. Your comment has been posted on dot earth, which supports my contentions at 11:48:06. I’ll defend Revkin’s integrity; I’ll not do so for Gore. I have “high hopes” that the Catlin critters will admit their PR stunt was scientifically useless. Also, “integrity” can be defined as taking the honest course of action before you are so backed into a corner by your lack of integrity that you have no choice but to admit error — yet Andy Revkin was still “parsing” on his way to the “naughty chair”. Sorry, Kim, but you come across as a doormat for Revkin. Interesting. I get none of my news from these entertainment organizations. Why pay, reward and enrich them for filtering the news with their own slant? I get mine direct off the web and can separate the wheat from the chaff myself without someone else’s filter [self-snip — if I cite examples, this could cause comments to degenerate into a whole different series of issues]. Now, I wonder why newspapers are having all those financial difficulties? circulation declines? Why TV viewership is down? Hmmmmm. You are making a straw man argument. No one is claiming that they don’t require proof of worth. First of all the modelers admit that there is uncertainty in their calculations. They give a value for Climate sensitivity of 3+/-1.5, and some maintain the uncertainty is larger. The models are based on physics and empirical constants developed from measurements of atmospheric phenomena. That is their proof of worth, in addition to agreement with hindcasts on a statistiical basis. The problem we are discussing is the Claim of the Climate Coalition, who represent auto manufacturers and energy companies, that they are writing a scientific document, while at the same time, removing sentences put in by their scientific pahnel, about the lack of credibility of sceptics arguments about alternative causes of warming, They ignored the statements of the scientists they employed, because they have an interest in delaying or stopping any action to limit CO2 emissions. This is the point made by the news article, and the error, made as a result of the use of an older version of the scientific advice, to make the point, when corrected, doesn’t invalidate the basic point made in the article. Removing a paragraph that is not agreed upon by authors and reviewers is normal, look at the IPCC Author and Reviewer comments for examples. I read the report, did you? The correction was grasping at credibility straws big time as a CYA maneuver, the end result was the basic central results of the report was mischaracterized by Revkin and now everyone knows it. This was not a correction in a name or a date this was a correction that invalidates the story’s central narrative. The report was used as a political “glove across the face of American Energy Industry” by Al Gore, and I think he owes an apology for his unprofessional and now unsubstantiated indictment of American Companies in some massive illegal fraud. They are spanking Lord Monckton like a school boy!!! RC responds to Lord Monckton saying he makes up graphs to fit his own ideas about things. They’ve challenged him to put up or shut up! The models are based on physics and empirical constants developed from measurements of atmospheric phenomena. The models are based on assumptions related to physics. And there is no empirical evidence that indicates CO2 increases heat retention in an open air environment where it’s concentration is changed and all other variables are held constant. To the moderator: sorry for my barrage of postings. It’s 20 degrees below “normal” and raining outside. Blame it on global warming. the correction doesn t change the article. pressure from the industry scored another minor point. congratulations. Hah, if you only knew. I also know Andy Revkin a lot better than you do. Some of the bitter true believers at dotearth used to refer to the place as dotkim. Revkin and the NYT, having been caught in what appears to be a deliberate and gross misrepresentation, continue to flounder in AGW-advocate fashion. They continue to try to put spin on the facts even as they turn slowly in the wind, their feet well off the ground of morality and ethics. 1. I don’t believe a backgrounder can be considered a scientific document. It is a policy document. 2. Sentences about the lack of credibility of alternative explanations are redundant in the presence of sentences that characterize climate science as uncertain. 3. The existence of great uncertainty was the point of the document, as great uncertainty does not form a sound basis for sweeping legislation. 4. “The facts are wrong but the conclusion is true” has no validity in journalistic ethics. Many careers have been ended by this approach to journalism. Sadly, many more need to end. be really, really pissed off! It is NOT the goal of auto and oil companies to emit more. It is, instead, in their best interests to go whichever way the wind is blowing. People want smaller, crappier, cheaper to build cars? GREAT! They want to use half the oil and pay twice as much for it? EVEN BETTER! The entire idea that “Oil Companies” and “Auto Companies” are on the reality side is just plain lazy thinking. They have as much to gain (or more) as anyone else who currently has their hands out. Unfortunately, this fact takes away the “Oil Industry” bogeyman that is the favorite target of the lesser informed warmists, therefore it is overlooked. At first, the oil companies were alarmed at what they rightfully perceived as a direct attack on their industry. It did not take long to realize the benefits and jump on board. Unlike some posters here, I have little expectation that Revkin will report fairly and critically, let alone ever do work that merits a Pulitzer Prize. How awful that would be. Never mind feeding the hungry, the “human footprint” might increase. (In fact, with greater economic development, fertility falls). Logic like this hasn’t been heard since Dr.Strangelove! No doubt like Strangelove Revkin views his solutions as “simple to understand… credible and convincing”. But remember Global Warming isn’t Revkin’s primary concern – for him, it’s another example that mankind is evil. maybe they should actually correct ALL their Global Warming articles by simply refering to WUWT website… that would be a real change. Gavin deleted my post at realclimate. Open and honest indeed! They also attack Monckton for being associated with SPPI while completely ignoring that Gavin is doing work for Environmental Media Services. He is an environmental activist who is obsessed with population control. I think he is self loathing, except that he’s afraid to go first! Richard deSousa The New York Times, and a lot of other MSM newspapers, are liberals and many of them are going bankrupt. Why? Because they’ve lost their objectivity and have become politically left leaning. During the Iraq war, they and the rest of the MSM were in lockstep with George W Bush. They didn’t seem very ‘liberal’ or ‘left’ back then (and it was only 5 years ago). More likely they just tack according to whichever way the political wind is blowing. Then, as now, it was left to a few outsiders on the internet to do the investigating. Perhaps it’s simply that if you’re a well-paid journalist working for the NYT, and putting a couple of kids through school, you don’t have much of an incentive to rock any boats. Why make life uncomfortable for yourself by asking too many questions? There’s not much to be won, and everything to be lost. It maybe takes a few lean and hungry outsiders, who don’t have too much to lose, and maybe quite a lot to win, to go after stories, and look for the truth. And maybe the same applies to science as well as journalism. Once science became professionalised, and people could make a living as scientists, they started to have one eye open to securing their tenure, winning the next contract. And it is left to outsiders to go where their investigations take them, rather than where concerns of personal financial security guide them. The commitment is like religion. There is no material evidence of a God but many intelligent people choose to believe. I don’t think it is an intelligence issue at all – it is more an emotive thing – some people need the support of strong beliefs despite the lack of any convincing evidence – I suspect this gives focus and meaning and comfort for those type people – whilst others are completely comfortable with major issues remaining undecided or unknown until conclusive evidence appears (the meaning of life, the universe and everything, including climate change). I doubt that AGW skeptics are any more intelligent than the AGW crowd but skeptics are the kind of people who do not jump to conclusions easily. I expect most skeptics recognize CO2 likely could have some warming affect but are simply unconvinced of claims by the AGW camp that we have figured out enough of the behavior of the entire global climate system to make solid conclusions about the overall impact. For all we know, there may be negative feedbacks from others factors; that CO2 is not the primary driver of our climate should be patently obvious to anyone. Ah. So RealClimate is continuing what they do best: attack the man, because they can’t refute his facts. And the fact that Monckton doesn’t care what they think must drive them straight up the wall. I seem to recall that when Gavin Schmidt formally debated the Viscount, Monckton publicly rubbed Gavin’s nose in the playground sand: going into the debate the audience were AGW believers — but following the debate, the majority no longer accepted AGW. Gavin Schmidt publicly failed, and everyone knew it. Afterward, trying to explain his embarrassing debate loss, Gavin Schmidt blamed it on the fact that Monckton is tall! Even though the debate took place with everyone seated. So it’s no surprise that Gavin is impotently nipping at Monckton’s ankles. The peanut gallery over at the RealClimate echo chamber is all he’s got. They’re real tough guys there, telling each other what’s what, huh? If Gavin Schmidt had the courage, he’d agree to another public debate with the Viscount. Like Kim (but not as well as Kim) I’ve spent a lot of time on dotearth. I respect that Revkin allows opposing views to air and he tries to be fair. But confirmation bias is strong in Andy and I think more than one activist on his rollodex convinces him too easily. A number of internet sites have brought the selective quotation used by your writer Andrew Revkin in the article Industry Ignored Its Scientists on Climate to my attention. I am writing to urge you to provide a considered response to Lord Monckton’s complaint regarding this matter. In considering your response you would no doubt be aware that your response or lack thereof will be widely distributed on the internet. As you may be aware an increasing number of citizens around the world believe that anthropogenic global warming is an unproven hypothesis. These citizens like myself have turned to the internet for a more balanced view of climate science than can be found in the main stream media. Thousands now know that the earth is cooling. Thousands know that Antarctic ice has been increasing for 30 years. They know that the GISS temperature record has been manipulated. They know the story of the “Hockey Stick” graph. They know about the venality of the IPCC. They did not find this information out from the main stream media. I would suggest that an editorial policy of advocacy journalese with regard to global warming is not in your publication’s best interests. Due to the internet the content of the New York Times is a matter of permanent and accessible record, and many are starting to question your impartiality. I would hope that you look to The Australian rather than The Guardian when considering editorial policy. I was pleasantly surprised when a NYT sub editor actually emailed back requesting clarification on the nature of the selective quotation, examples of ice growth and global temperatures. I was happy to provide links to the relevant data. While some who have posted above may feel that the NYT may not have responded adequately to the matter, I feel that they have made a greater effort than many other publications may do. NYT editors have certainly shown they are aware of the number of people discussing climate issues outside the main stream media. I would hope the nuances of this story are fully noted by your legislative representatives and the crude attempt to smear industry treated with the contempt it deserves. In my opinion, far from being duplicitous, the legacy of industry support in the US for academic research is very praiseworthy. Earth Science has had outstanding support from oil majors in particular, with huge advances in plate tectonics and sea floor spreading, sedimentology, stratigraphy, micropalaeontology and palynology, magnetic reversal chronology. Many of your world famous institutes were founded by philanthropic benefactors, such as the Lamont Docherty (from oil pioneer Henry Docherty), and most benefit directly from access to huge volumes of proprietary geophysical, core and log subsurface data. Exxon has a long history of student scholarship and research grants and these are (at least mine was) totally free of any strings or agenda. Their own researchers were in the vanguard of work on seismic stratigraphy and global sealevel studies. The New York Times should perhaps examine their navel if they are looking for duplicity. Just sitting back waiting until Gas is $4 a gallon and I can say, it’s Obama and his CO2 buddies. The fact that the ‘Dot Earth’ moderator (maybe even Revkin himself) chose to publish my comment is not a sign of integrity. Even if it were, it would take millions of such minute acts of integrity to offset the damage done by the fallacious front-page story authored by Revkin. Monbiot attempted to make a citizen’s arrest of former United States UN Ambassador, John R. Bolton, at the Hay Festival of Literature & Arts in Hay-on-Wye. The attempt was unsuccessful as Monbiot was grabbed and ejected by security men. Using a public loon such as Monbiot as his first supporting quote is, in and of itself, prima facie evidence of Revkin’s lack of integrity and should cause concern for his editors and readers. The fact that you claim to “know” Mr. Revkin better than I (“dotkim”, etc. ), only makes me feel a bit uncomfortable about you and wishing to end addressing you any further. Very wise words Idlex. I think much of that is true, unfortunately. It applies to our media as well. Hahahaha, I wonder which lone reader it was! Monckton? Carter? A server-load of WUWT readers? How about the ‘warmists’ looking back at statements made by Gore, Hansen and their ilk regarding loss of Arctic ice caps, values of CO2 that are ‘tipping points’ and many other ‘certainties’ that have never come to fruition? It seems that the MSM only looks for ‘inconsistencies’ in the anti-AGW argument. Because AGW justifies a political stance, socialism, and these organizations are agents of this political position. MC: Don’t let any Audiophiles hear you refering to Barium Titanate as a dielectric. Their beliefs can put most warmers to shame and hi-k ceramics are one of the few times that they have a valid point! eric (12:27:11) : You are making a straw man argument. No one is claiming that they don’t require proof of worth. Hardly a straw man. The onus of proof is on the claimers — not the other way ’round. Proof from the claimers is very lacking. BTW: that should include proof that 1) CO2 and Temperature are truly correlated (there’s ample evidence otherwise, the past decade for example) if 2) man-made CO2’s influence is truly significant. The latter has yet to have been shown by anyone. If so, then why has the Precautionary Principle been espoused if the proof is incontrovertible? If so, then why was MBH 1998 welcomed and paraded like a favorite pony then vigorously defended if other proof is available. First of all the modelers admit that there is uncertainty in their calculations. Of course there is but testing one should be straightforward, albeit tedious: see if they predict the future. So far I’ve only seen proofs with the models predicting the past (see below). That’s not very hard to do. I can predict Monday’s closing price for any NYSE stock you wish to select — as long as you ask me on Tuesday. They give a value for Climate sensitivity of 3+/-1.5, and some maintain the uncertainty is larger. The models are based on physics and empirical constants developed from measurements of atmospheric phenomena. That is their proof of worth, in addition to agreement with hindcasts on a statistical basis. It’s the hindcasts in particular which are hilarious. The model is tuned until the hindcast is ‘accurate’ (and that really means that the average of all models are kinda close — even then sometimes its the past that needs adjusting al a GISS) then the hindcast ‘accuracy’ is used as proof of correctness. LOL. I hope you’re a horse bettor — I want your money. The problem we are discussing is the Claim of the Climate Coalition, … are writing a scientific document, while … removing sentences put in by their scientific panel, about the lack of credibility of sceptics arguments about alternative causes of warming, They ignored the statements … because they have an interest in delaying or stopping any action to limit CO2 emissions. 1. Did they actually claim it a scientific paper or is it a white paper? It makes a difference you know. I normally would expect a white paper from groups calling themselves a ‘Coalition’. Oh, yeah, there’s nothing wrong with white papers. 2. The Coalition deleted (ignored) an irrelevant comment. Again: no alternative needs to be proffered. That some have been but were unsuccessful is indeed irrelevant. Take my ET Visitation Hypothesis example, If I shoot down every alternative you propose it does nothing to prove my hypothesis correct. You are engaging in fallacious thinking if you believe otherwise. I think the NYT may be depending upon you doing so. Otherwise, I don’t understand the equivocation of their ‘correction’. Also: what CodeTech (14:14:13) said. If you want to consider selfish agenda think about this: Back in the bad ol’ days of heavy smog in a lot of cities, it was the stated goal to reduce exhaust emissions to nothing more than water and CO2. That goal has been largely met but — surprise! — it’s not good enough! Makes me wonder about the real motive of Green People. They certainly look closer to Monckton than the realclimate comparison charts. Fusor could NOT PRODUCE ANY FUSION REACTIONS PERIOD..
an equally abrupt hang up. George published in a couple other respectable journals. Dimeler Benz offers “production” versions of the Inertial Electrostatic Confinement devices as “controlled high energy neutron” sources, and one of George’s graduate students was conferred with his Phd in Nuclear Engineering based on his characterization of the neutron flux from the “Farnsworth Fusor”. Purity, uncorruptable, non-paradigm controlled nature of “science”? HA! Does not exist. Wish we could make that clear to the public. The subscriber must have complained. I’ll predict that Revkin’s correction will mark the turning point in the debate, and momentum will move to the skeptics and away from the AGW believers. Let’s see how the reporting from the NYT evolves. Ah. So RealClimate is continuing what they do best: attack the man, because they can’t refute his facts. Smokey, refuting Monckton’s so called “facts” is what Gavin did in his blogpost. He shows that misrepresented the IPCC’s projections in his silly graph, which arbitrarily picked 2002 as a starting date. Monckton is nothing but a poseur and deserves to be spanked. His articles are full of errors and misrepresentations. From another NYT article previously referenced above..
Actually, Mr. Perkowitz, I think it is because people are smart enough to realize “global warming” is code for the political agenda of organizations such as yours! And that there is NO scientific evidence for it actually happening. This article is like a comedy routine of AGW proponents trying to come up with new words for events that clearly are not occuring. I would love to know some of the “corporations, foundations, and individuals” who help finance this EcoAmerica organization…so I can not buy their products or services! There was also a “headline” on Yahoo last night and today about the “disappearing wonders of the world”, including the “sinking” Maldives. Do I sense a journalistic desperation to try to stop the tide of skeptics and actual science from overwhelming the MSM?? That whole article was full of disproven environmental fallacies. Still no facts, I see. RC responds to Lord Monckton saying he makes up graphs to fit his own ideas about things. Well that is their area of expertise. Well, thanks. You do pretty well yourself there, and have persisted. I had a LOT of fun last year over there and I’ve little doubt that the message I purveyed sank in to some of the readers. They can look back and see how right I was most of the time. I agree that George Monbiot is pretty far out there. You’ve got to remember that Andy Revkin is also a true believer of many years standing, and has deep connections with the alarmist camp. I think Syl’s evaluation of him in her 15:36:15 comment is pretty much right on. He does a lot of the moderating on his blog, and I’m pretty sure he reads all of the comments, and I’m here to tell you that he thinks about them and responds to them in a way that is unusual for true believers of his stripe. He is an honest journalist, still unconvinced that the CO2=AGW paradigm is so terribly exaggerated. I’d also like to repeat my two cents worth that it was MJW who wrote the note to him which caused him to re-evaluate this story. He promised her that he was doing further research and would write another story. I’d also like to respond to the slander that he hates people. He is very concerned that humans use all the means at their disposal to adapt to a prospective population of 9 billion, but I’ve not really heard him suggest that the best idea is to reduce our population. Many of the commenters on his blog have excellent ideas about the way to get to sustaining a population of 9 billion. Though most of the alarmists over there are hateful and ignorant people, there were some who were fair debaters and capable of absorbing and evaluating contrary opinion. As I say, I had a good time there, for almost nine months, and it is usually a matter of days, if not hours, before I get tossed off of alarmist blogs. Kim was nice enough to mention me above. I’m the “reader” referred to in the NYT correction (I would have preferred “alert reader” ala Dave Berry). I’d posted a comment on Climate Audit about the article, and Kim suggested I send it to the writer, Andrew Revkin, which I did. We exchanged a number of emails on the article. Revkin was polite and seemed genuinely sorry for missing the revision of the backgrounder. I’m not completely happy with the Editors’ Note. I have several issues with the general content, and a specific factual dispute. First, the factual dispute. The correction says, “The later version was distributed publicly in 1998, but existed in some form as early as 1995, according to an online archive kept by Greenpeace.” That gives the impression that the GCC made a change to the backgrounder, then withheld it for more than two years. The facts a different. The 1995 date is from a Greenpeace dossier on the GCC, called gcc_about_all.pdf, which contains a copy of the backgrounder with the revised wording. The pages are dated 06 Dec 1995. This is the document I originally mentioned to Revkin. According to the Editors’ Note, this is a draft copy, though I don’t know how that was determined. The 1998 date is from a copy of the backgrounder that I found through the web.archive.org “Way Back Machine” and emailed (as a link) to Revkin. The date of the archived page is 24 Jun 1998. The problem is, 24 Jun 1998 was the first date on which the GCC’s website, http://www.globalclimate.org, was archived by the Way Back Machine. So while there’s no proof the updated backgrounder was distributed before that, there’s also no reason to believe it wasn’t distributed at about the time it was written in 1995. I set several emails to Revkin arguing that the Editors’ Note gives a false impression of the time-line and suggesting how it might be reworded, but my concerns were dismissed. My other objections are more general. The Editors’ Note implies that despite the correction, the thrust of the original piece remains unchanged. But without any evidence that the GCC was engaged in misrepresentation, all it really amounts to is a long opinion piece asserting the GCC’s position on greenhouse gas reduction was unreasonable given the evidence. The article and the Note make hay of the fact that the GCC voted to omit from the primer the section on contrarian arguments. But since the primer was never publicly distributed, why does that matter? The article doesn’t even explain how the edited version of the primer was used. Even if the primer were publicly distributed, would omitting the section on contrarian arguments really be a scandal? The GCC made no bones — or at least very few — about being a lobbying organization. How many other advocacy organizations are expected to make their opponents’ arguments for them? I haven’t noticed Greenpeace issuing documents pointing to weaknesses in pro-AGW arguments. Advocacy groups aren’t expected to take the even-handed approach expected of scientific journals. Heck, I be satisfied if scientific journals took the even-handed approach expected of scientific journals. I look at the AGW advocates like Al Gore, Gavin Schmidt, James Hansen, and eric here and what I see in them is one glaring ignoble quality: they want to win their argument by any means necessary even — if it means employing the most unprincipled, petty behaviors human beings have resorted to throughout history: ad hominem attacks, diversions, straw men, and just plain meanness. I used to think highly of these environmetal pseudo religious liberals — I was one. Now I am ashamed to think I ever wanted to belong to this group, which continually display some of the most despicable traits human beings are capable of. Where is their honesty? What happened to their decency? And how is it possible that so many have been duped by so few? What is wrong with us as a people? Does truth count any longer. Perhaps the death throes at the NYT is a hopeful sign that Lincoln’s wisdom is starting to manifest: You can fool some of the people all of the time, and all of the people some of the time, but you can not fool all of the people all of the time. ” Imagine how odd it is that this can be said of a major news organization today. Now, that’s sad. Kim: He promised her that he was doing further research and would write another story. Now we know how the warmists grid stories so that they become mainstream news and can be fed into public awareness on Global Warming. 1. Gore needs a good reference point for his congressional testimony. 2. NYT provides that reference point with a front page story. 3. Andy Revkin writes the words needed. 4. Gore give his testimony blaming corporate America for ignoring its own scientific advice. However it turns out to be nonsense. Revkin and the NYT were wrong, utterly wrong, correction follows, but Gore was able to walk away from the scene of the crime with his hands clean. What it reveals is the Andy Revkin is just the news monkey to Al Gore’s organ grinder. Music to the ears. Climate “science” has a definite shortage of methodical and well-characterised experiments. Their preferred method seems to be to work backwards from a huge model lacking precisely such experiments. It’s amazing how an underestimated factor, especially with a higher power, can completely toss a model because nobody did the calibration work via a well-characterised experiment. So tune it instead. Or ignore reverse causation. Here’s to more Starbucks. Has anyone here tried to post a comment on realclimate? I just did – and it was continually rejected as ‘spam’. A note told me to check for dodgy words – which I did, but I had to give up for my sanity. Do they only allow favoured contributors? I’d like to add a couple of additional comments about the NYT correction which I should have said in the initial comment. First, I don’t think they were intentionally misleading in their description of the backgrounder timeline. In the email I sent giving the Way Back Machine 1998 version of the backgrounder, I described how I got it, but I didn’t go into detail about which webpages were and were not archived. Second, I think I saw it mentioned somewhere that the print version published the correction in the Saturday edition. If that’s true, perhaps that’s why they were unenthusiastic about modifying the Editors’ Note. Though if that was the reason, Revkin didn’t mentioned it to me. Perhaps he assumed I could figure it out for myself. Revkin didn’t tell me a correction had been added to the story. I noticed it on their website on Friday night, and immediately sent an email comment on what I viewed as a problem. Considering I did the research and provided both of the sources on which the correction was based, I think it would have been considerate for them to let me see it ahead of time; but that would no doubt violate some principle of journalistic integrity. Despite all the biased climate reporting by the main stream media, the skeptic blogs are doing a fine job. At iceagenow I have found this e-mail send by a reader addressed to EPA. The title is strong and says it all. The weak point however is the writer’s remark about population control because that is the true objective behind the AGW hoax. We all know that industrialized countries with a high standard of living make the best guarantee for population control. Declaring CO2 a pollutant is declaring tyranny! Please stop this nonsense of claiming that CO2 is a pollutant. Declaring CO2 a pollutant is declaring tyranny. No human activity would fall outside the reach of the EPA. Why would anyone concerned with global warming want to regulate CO2 emissions of industrialized societies but not control deforestation and overpopulation? You are falling for a Marxist hoax. Or, worse, you are perpetrating a Marxist hoax. Ice ages have come and gone long before mankind industrialized. (Visit http://www.iceagenow.com) They will come and go long after your luddite regulations have collapsed the economies of the industrialized world. It is the ultimate hubris to think modern man’s actions could control the weather. I presume you know the reality of the global warming hoax. I write to beg you not to continue your tyrannical political scheming. You will not succeed in denying Americans’ God-given rights to life, liberty, and pursuit of happiness. Please give up trying to rule the world. I suggest that you re-focus on protecting America from real pollutants like the mercury in those nasty “eco-friendly” lightbulbs which save so-o much electricity by reducing incidental heat emissions in cold, dark New England winters. Do you really think everyone’s going to recycle them? What I don’t understand,is they cry of” industry!/Oil company!!/COAL!! !” “Profits! !” when the “Profit” himself-Algore is making millions or hopes to by carbon trading. They wonder why the NYT is going out of business. It’ll be great if the govt. bails em out and takes an ownership percentage. I regret and reject the implication that I am somehow behind AGW alarmism. When I wrote the Communist Manifesto, and Capital, I didn’t think about carbon dioxide even once. Don’t you bourgeois capitalists have a heart? I’m still being blamed for Stalin’s crimes, and now you’re saying that I made Al Gore! Nonsense! Cap-and-trade is entirely consistent with capitalist modes and relations of production, and entirely consistent with capitalism. Go and ask Adam Smith or Thomas Malthus, if they’re still around – capitalists, both of them. Anyway, it’s the proletariat who will suffer from cap-and-trade, not the bourgeois capitalist classes, you can be sure of that. Karl is absolutely right, cap-and-trade is entirely consistent with my views, and I’m a classical liberal economist. I’m a capitalist, and Al Gore is my buddy. WRT attempts to “frame” the argument with more maleable language, a while back, Lucia noted this brilliant strategy by a “communications” expert. Add to this the thigh-slapping claim by some true believers that the term “Climate Change” was actually invented by Republican strategist Frank Lunz (Google: “Climate Change” “Frank Lunz”; just don’t have anything in your mouth when you read the results! ), and you’ve got some real head-scratchin’ (as well as thigh-slappin’) “framing strategies” to contemplate. I agree with Kim on this one. Andy Revkin has carved out a unique niche in the GW debate. He works for a bastion of the liberal media and is ostensibly a True Believer. But he does not use the same playbook as Real Climate, DeSmog Blog, and all the other haters. He’ll post on “inconvenient” topics for alarmists. He doesn’t appear to censor, either. If I’m not mistaken, I believe we have to read between the lines with Andy. He can be turned when the facts will allow him to. Think ahead. You need someone on their side to flip. For those old enough to remember, think Walter Cronkite turning on the Vietnam war. It would behoove you all to engage frequently on his blog, especially when he finally posts on feedback and on the PDO. Remember, the alarmists have failed miserably because they do not want to persuade us so much as they want us to submit. Monckton’s graphs are not reasonable, creating IPCC predictions based on chopping their 100 year trend by a factor of 10. I sometimes wonder if the scientists, political campaigners and supporters of the case for blaming climate change solely on human activity (sorry but I don’t like pseudo-scientific made up words) are so stupid they are the best argument against their own case. The climate is changing. It is too late for scientists to be blethering about who or what is to blame or Politicians with an eye on future campaign contributions backing decidedly dodgy technologies that are not guaranteed to work but are guaranteed to make some people very rich before they are proved counter productive. WE NEED TO BE DEALING with real world stuff like food and water supplies. Certainly the public perception is that of Monckton’s graph. And the scare stories that surrounded the Arctic situation in 2007 and 2008 certainly added to this perception – that is enhanced on many web sites such as realclimate. However, it seems to be (based on current evidence and not computer models) that alarming climate change is a myth. Just as it seems to be that this year’s Arctic ice extent will not even worry the BBC (although they are unlikely to report on it if it turns out to be a record-build). I can’t be alone in finding that we seem to want to worry ourselves. I’ve no doubt that ‘Swine Flu’ will turn out to be a mild one that should never have worried the world. Climate change, despite its initial ‘promise’ of doom seems to have been way-overblown. Looking at the graph of global temperatures for the past 20 years I cannot for the life of me see what worries some people. With some predictions of a strong link with the PDO comes forecasts of falling temperatures for the next 20 years. The caveat is that these are yet again – guessed, just as alarming warming was. So far, that ‘warming’ guess has turned out to be incorrect. The public have been told that the world will fry, and that is why Monckton’s graph will sit very comfortably in the minds of people. The warming-worriers are to blame for that. Whether or not his graph is factual has become irrelevant. The science of this went out of the window when computer models were brought in. We were no longer saying what is happening, but what we think will happen. As I cannot remember anyone 10 years ago telling me that by 2009 the global temperature would have fallen by 0.03 degrees C (that’s what my calculator says) then I conclude that we are in the realms of appealing to the public’s mind, rather that actuality. And many people reading realclimate are to blame. Not at all. The vigorous defence of Scientific Truth by sites like this provide those who wish to make up their own minds with the data to do so. That a small group of Scientists have sold out to the call of politics and BIG TAX is demeaning to the integrity of science. But Google caching should enable a witch-hunt of the perpetrators, and having sold their credibility I see little for them beyond ridicule. Gore, however, needs to be banged up! I think (MJW (01:51:59)) comment is worth considering further. One line of debate is exemplified by Kim, which is that Revkin is essentially a decent fellow and allows dissent on the blog. Certainly Kim knows of what s/he speaks receiving more than enough invective from the faithful over there on Dotearth while still being allowed a venue, however this is why we should look at MJW’s comment. Alternatively one could interpret it that Revkin tried to bury the correction on a slow Saturday and not even telling MJW that the correction had been posted. If you examine the timeline of updating Dotearth comments to the correction there has been only one on Sunday by 4:30 pm EST. Of course the MSM typically buries stories this way but has not learned that blogs like WUWT are more active over the weekend when most normal people have time away from their paying jobs. I hope Revkin appreciates Kim’s defense, but more compellingly would be for the NYT initiate reporting on the repeated malfeasance of data releases and poor science so well demonstrated at this site and as first courageously demonstrated by Steve McIntyre over at Climate Audit. MikeN. Which scientists don’t accept that fall? I worked that out (maybe very slightly out with these new-fangled calculator thingies) using HadCRUt figures for the past 10 years. As Sandy says, any such scientists should be listed. Does anyone even read the NYT anymore? Has anyone here tried to post a comment on realclimate? I just did – and it was continually rejected as ’spam’. A note told me to check for dodgy words – which I did, but I had to give up for my sanity. Do they only allow favoured contributors? I’ve written about it before, I believe. To evaluate claims, or to distinguish signal from noise, we apply networks of trust to decide who we should use our limited time to listen to. It’s not unlike google’s algorithm, where a link from an important site carries more weight than from an unimportant one. Everyone does it, but in science it’s institutionalized in the peer review process: a respected peer gets to set the agenda more, decide which results are important, which paths should rather be explored. First, despite their denials, RC is a heavily political discussion blog. As President Eisenhower pointed out, government money is dangerously corrupting science. Government in a democracy is inherently political. Gavin Schmidt is James Hansen’s immediate subordinate. The entire agenda of RC is to politicize science in order to divert more money into government-favored pockets. The next false claim is that other sites are paid to “promote a certain agenda.” This is pure psychological projection, in which one’s own wrongdoing is imputed to others. It has been disclosed that George Soros financially supports RealClimate. And James Hansen, purportedly working for the taxpaying public, is the recipient of over a million dollars in cash from organizations with an AGW agenda. As numerous posters at WUWT have made clear, RC routinely censors comments that dispute their AGW agenda. RealClimate is a propaganda site. That is one of the main reasons they did so poorly in the Weblog Awards; people don’t want to be spoon fed propaganda. WUWT won the “Best Science” site award because this site provides a forum for all points of view, while RealClimate is an echo chamber that deletes/censors uncomfortable comments [the final vote total gave WUWT ten times the number of votes that RC got]. It corrupts science when a government agency runs a blog that censors comments from taxpaying citizens, in order to please those who give hefty cash donations to those running the blog. Thanks, Rick, that’s interesting. Revkin said something similar to me one of his emails. I didn’t know until I read the Yale article that he’d seen Greenpeace’s GCC file before I mentioned it to him. I’d wondered why he considered it a serious mistake rather than just a lack of awareness of the revised backgrounder. I still think I’d judge him less harshly for the error than he judges himself. On the other hand, I’d judge him considerably more harshly than he judges himself for the original article, whose underlying issue he claims still stands. Even without the revised backgrounder, that article fails to support its premise. He admits the older version of the backgrounder was circulated in the early 90s, yet somehow offers it as proof the GCC was denying the conclusions of the late 1995 scientific report. He also asserts in the original piece– and continues to assert — that omitting the section on contrarian arguments from the primer was highly significant, even though the primer was never made public. He might have argued that the primer was intended to be made public, but then suppressed. Since he didn’t, I tend to assume he found no evidence that that happened. I’m a bit confused about his attribution of the error to the “tyranny of time.” The events he wrote about occurred more than 13 years ago; I doubt a week or two’s delay would have spoiled the newsworthiness. I can’t think of a looming deadline — well, other that Gore’s Capitol Hill testimony (that’s mostly just a cynical joke).